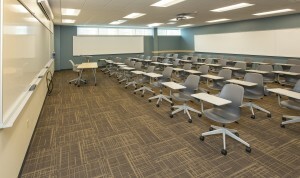 St. Norbert College in De Pere, Wis., constructed a state-of-the-art science facility, the Gehl-Mulva Science Center, from 2013 until early 2015. The Walls & Ceilings and Commercial Flooring divisions of H.J. Martin worked on the new structure, which replaced a building that was nearly 50 years old, the John R. Minahan Science Hall. The 150,000-square-foot Gehl-Mulva Science Center features 36 laboratories for research and teaching, along with small-group workrooms and informal collaborative spaces, among other things. It also will house the new Green Bay campus of the Medical College of Wisconsin, scheduled to admit its first students in July 2015. An H.J. Martin Walls & Ceilings team ranging from 4-6 members installed metal studs, drywall and sound insulation, both for the new structure and as part of the remodel of the existing space. The challenges of phased work while students were in-between buildings and winter conditions were met seamlessly over a 16-month period. The Commercial Flooring division of H.J. Martin touched virtually every area of the new science center. More than 600 cartons – 26,400 square feet – of Mannington Progressions 24×24 Vinyl Composite Tile (VCT) was installed in the classrooms and corridors. Twelve different colors of VCT were utilized. Complementing the VCT in lecture halls, conference rooms, some corridors, lobbies and break rooms are Atlas Kinetic modular carpet tile and Masland carpet tile, both in 24×24 sizes. Almost 30,000 SF of Daltile tile was installed within the restrooms – Santino on the floors, along with Invoke wall tile. Crossville Ebb and Flow mosaic tile was used behind the sinks to provide a high-end look. 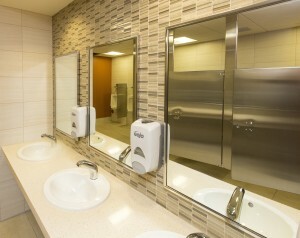 Daltile Metal Fusion Tile was utilized in vestibule areas. Miron Construction of Neenah, Wis., served as general contractor for the entire project, which cost approximately $39.2 million.